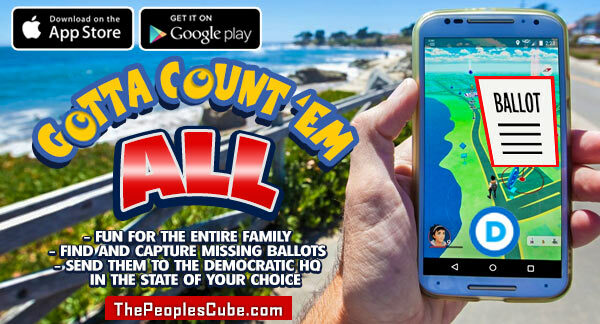 Find missing ballots with the new Gotta Count 'em All™ app! Gotta Count 'em All™ is the exciting new app that's taking the nation by storm. Using your phone's GPS, this amazing app enables you to find and capture missing ballots so you can send them, via a secure connection, to the Democratic headquarters in the state of your choice. Re: Find missing ballots with the new Gotta Count 'em All™ app! I think Snipes has been playing this game for a long time. LOL. God Bless the Peoples Cube.